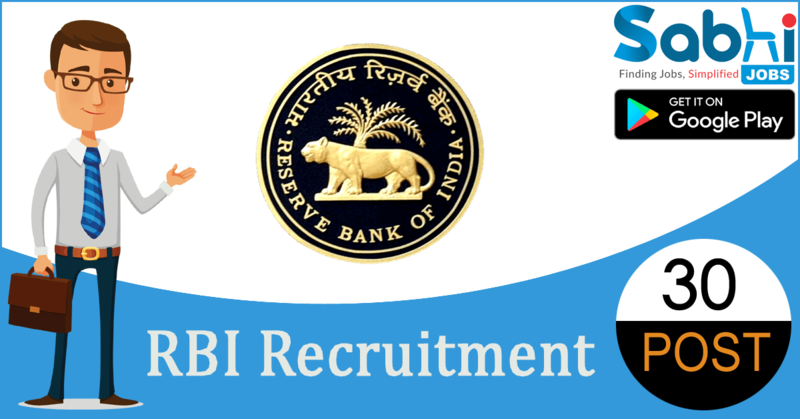 RBI recruitment 2018-19 notification has been released on official website www.rbi.org.in for the recruitment of 30 vacancies at Reserve Bank of India. The candidate who is looking for Manager (Technical-Civil) in Grade B, Assistant Manager (Rajbhasha) in Grade A & Various Vacancies can apply online application from 19th July 2018 and before 10th August 2018. Qualification Manager: A Bachelor’s Degree in Civil Engineering or equivalent qualification with a minimum of 60% marks or equivalent grade in aggregate of all semesters/years. Assistant Manager: Second Class Master’s Degree in Hindi/Hindi Translation, with English as Core/Elective/Major subject at the Bachelor’s Degree level OR Second Class Master’s Degree in English with Hindi as Core/Elective/Major subject at the Bachelor’s Degree level OR Second Class Master’s Degree in Sanskrit / Economics / Commerce with English and Hindi as Core/Elective/Major subject at the Bachelor’s Degree level (In lieu of a subject of Hindi at Bachelor’s Degree level, one may have recognized Hindi qualification equivalent to a Bachelor’s Degree) OR Master’s Degree in both English and Hindi/Hindi Translation, of which one must be Second Class. Selection Process Selection will be based on Examination (Online & Offline) and Interview. How to Apply Interested and eligible candidates may apply online application form at official website www.rbi.org.in from 19th July 2018 to 9th August 2018. Correspondence with the Board: The Board will not enter into any correspondence with the candidates about their candidature except in the following cases: The eligible candidates shall be issued an Admit cards two weeks before the commencement of the examination. The Admit cards will be made available on the Bank’s website www.rbi.org.in for downloading by candidates. No Admit cards will be sent by post. If a candidate does not receive his e-Admit card or any other communication regarding his/her candidature for the examination two weeks before the commencement of the examination, he/she should at once contact the help facility as mentioned above. No candidate will ordinarily be allowed to take the examination unless he/she holds an Admit card for the examination. On downloading of e- Admit Card, check it carefully and bring discrepancies/errors, if any, to the notice of Board immediately. PROOF OF IDENTITY TO BE SUBMITTED AT THE TIME OF EXAMINATIONS: At the time of appearing for the examination, candidates are required to produce a currently valid photo identity card in original and a photocopy of the same in addition to the Admit card. Acceptable photo identity cards are PAN Card/ Passport/ Driving Licence/ Voter’s Card/ Bank Passbook with photograph/ Photo identity proof issued by a Gazetted Officer on official letterhead/ Photo identity proof issued by a People’s Representative on official letterhead/ valid recent Identity Card issued by a recognised college / university/ e-Aadhar card / Aadhar card with a photograph/ Employee ID/ Bar Council Identity card with photograph. The candidate’s identity will be verified with respect to his/her details on the Admit card /Examination Call Letter, in the Attendance List and requisite documents submitted. If identity of the candidate is in doubt the candidate may not be allowed to appear for the Examination. Note: Candidates have to produce in original the photo identity proof and submit a photocopy of the photo identity proof along with Admit Cards while attending each shift of the examination without which they will not be allowed to take up the examination. Candidates will have to carry two/three photocopies of photo ID proof, as there will be two/three shifts. Candidates must note that the name (provided during the process of registration) as appearing on the call letters should exactly match the name as appearing on the photo identity proof, certificates, mark-sheets. Female candidates who have changed first/last/middle name post marriage must take special note of this. In case of candidates who have changed their name, will be allowed only if they produce – original Gazette Notification/their original marriage certificate/affidavit in original,together with a photocopy. If there is any mismatch between the name indicated in the Admit card and Photo Identity Proof, the candidate will not be allowed to appear for the examination. The Board would be analyzing the responses of a candidate with other appeared candidates to detect patterns of similarity. On the basis of such an analysis, if it is found that the responses have been shared and scores obtained are not genuine/ valid, the Board reserves the right to cancel his/her candidature. Board does not assume any responsibility for the candidates not being able to submit their applications within the last date on account of or for any other reason beyond the control of the Board. The candidates should note that their admission to the examination will be purely provisional based on the information given by them in the Application Form. This will be subject to verification of all the eligibility conditions by the Board / Bank. The mere fact that an Admit card has been issued to a candidate, will not imply that his/her candidature has been finally cleared by the Board or that entries made by the candidate in his/her application for the Preliminary examination have been accepted by the Board as true and correct. Candidates may note that the Board takes up the verification of eligibility conditions of a candidate, with reference to original documents, only after the candidate has qualified for the interview. Unless candidature is formally confirmed by the Board, it continues to be provisional. The decision of the Board as to the eligibility or otherwise of a candidate for admission to the Examination shall be final. The possibility for occurrence of some problems in the administration of the examinations cannot be ruled out completely, which may impact test delivery and/ or result from being generated. In that event, every effort will be made to rectify such problem, which may include movement of candidates, delay in test. Conduct of a re-exam is at the absolute discretion of RBISB/test conducting body. Candidates will not have any claim for a re-test. Candidates not willing to move or not willing to participate in the delayed process of test delivery shall be summarily rejected from the process. Candidates are advised to keep their e-mail ID/mobile number alive for receiving advices viz. Admit cards/Interview letters, etc. Candidates may check e-mails/SMS regularly. The Board does not send any communication through any other mode. The posts are also open to the employees of RBI (Staff Candidates) who satisfy the eligibility criteria separately stipulated by the Bank vide their circular CO.HRMD.No.G75/5599/05.01.01/ 2013-2014 dated December 20, 2013 and who apply Online within the closing date. Their status as staff candidate will be verified at the time of interview. The Board does not furnish the mark-sheet to candidates. Marks obtained in Examination andInterview will be made available on the Bank’s web-site in an interactive mode only after declaration of the final result. Any canvassing by or on behalf of the candidates or to bring political or other outside influence with regard to their selection/recruitment shall be considered as disqualification. In all matters regarding eligibility, conduct of examinations, interviews, assessment, prescribing minimum qualifying standards in both the Examination and interview, in relation to number of vacancies and communication of result, the Board’s decision shall be final and binding on the candidates and no correspondence shall be entertained in this regard. The eligibility for availing reservation against the vacancies reserved for the persons with Benchmark disabilities shall be the same as prescribed in “Rights of Persons with Disabilities (RPWD) Act 2016″ Provided further that the persons with Benchmark disabilities shall also be required to meet special eligibility criteria in terms of physical requirements/functional classification (abilities/disabilities) consistent with requirements prescribed. A candidate will be eligible to get the benefit of community reservation only in case the particular caste to which the candidates belong is included in the list of reserved communities issued by the Central Government. If a candidate indicates in his/her application form that he/she belongs to General category but subsequently writes to the Board to change his/her category to a reserved one, such request shall not be entertained by the Board. Similar principle will be followed for PwBD categories also. In case of a candidate unfortunately becoming physically disabled during the course of the examination process, the candidate should produce valid document showing him/her acquiring a disability to the extent of 40% or more as defined under RPWD Act, 2016 to enable him/her to get the benefits of PwBD reservation. Candidates seeking reservation/ relaxation benefits available for SC/ST/OBC/PwBD/Ex-servicemen must ensure that they are entitled to such reservation/ relaxation as per eligibility prescribed. They should also be in possession of all the requisite certificates in the prescribed format in support of their claim as stipulated for such benefits and these certificates should be dated earlier than the due date (closing date) of the application. Any resultant dispute arising out of this advertisement shall be subject to the sole jurisdiction of the Courts situated at Mumbai only.